(Newser) – A priceless bag used during the first moon walk was accidentally sold at a government auction, and is now the center of a legal dispute, the AP reports. Neil Armstrong and Buzz Aldrin tucked moon rocks into the white sack they took with them during the Apollo 11 mission in July 1969. After discovering the bag was hawked last year, the government is now scrambling to reverse the sale. The bag is embedded with space material and is "a rare artifact, if not a national treasure," officials say. Although a clerical error was to blame for the sale, the bag caper dates back to the case brought against Max Ary, the ex-director of the Kansas Cosmosphere and Space Center, who was convicted in 2005 of stealing and selling museum artifacts. 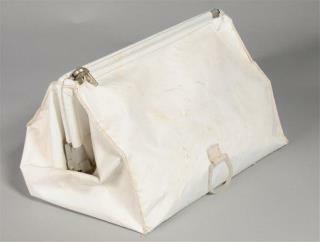 The Apollo 11 bag was among hundreds of items found during a search of his garage. what else is new? this IS the u.s. gov after all! The rock that had letter C on it.